"Calibration Model Maintenance in Melamine Resin Production: Integrating Drift Detection, Smart Sample Selection and Model Adaptation"
Since April 2017, Laura Peham is supporting us in the ongoing industry project of Chrome Coating Inspection for Heidenhain . Welcome aboard! "Advanced Linguistic Explanations of Classifier Decisions for Users' Annotation Support"
Open Position "Advanced Chemometrics for Industrial Processes"
The Department of Knowledge-Based Mathematical Systems (FLLL) at the Johannes Kepler University Linz (JKU) is offering a position for an experienced researcher, Junior as well as Senior, in the field of statistical and data-driven modeling with a specific emphasis on advanced Chemometrics for the supervision of industrial processes. Open PhD Position in "Transfer Learning"
The Department of Knowledge-Based Mathematical Systems (FLLL) at the Johannes Kepler University Linz and the Software Competence Center Hagenberg (SCCH) are offering a PhD position in the field of transfer learning with soft computing models for regression problems. Am Institut für Wissenbasierte Mathematische Systeme wird die Betreuung von Bachelorarbeiten (Studiengang Technische Mathematik) bzw. Masterarbeiten (Studiengang Computermathematik) angeboten. Mitarbeit bei FWF-Projekt "Neue Perspektiven auf residuierte Halbordnungen" möglich. Seit Jänner 2015 ist am Institut für Wissenbasierte Mathematische Systeme ein internationales FWF-Projekt zum Thema „Neue Perspektiven auf residuierte Halbordnungen” angesiedelt. Grundlagen der Fuzzylogik: Wir befassen uns mit einem Verfahren zur Bestimmung von Strukturen, die bei der Modellierung in der Fuzzylogik Verwendung finden. Seit vielen Jahren bietet unser Institut Mathematik-Lehrveranstaltungen für Studierende der Technischen Mathematik, Informatik, Mechatronik, Informationselektronik, Kunststofftechnik und Wirtschaftswissenschaften an. The Department of Knowledge-based Mathematical Systems at the Johannes Kepler University Linz in collaboration with the Software Competence Center Hagenberg (SCCH) is offering a PhD position in the field of "transfer learning", a specific research direction within the field of machine learning and data-driven modeling. Partner of the granted 'IKT of the Future'-Project "useML"
"useML - Improving the Usability of Machine Learning in Industrial Inspection Systems"
The book Learning in Non-Stationary Environments: Methods and Applications offers a wide-ranging, comprehensive review of recent developments and important methodologies from renowned international researchers in the field of incremental learning and evolving methods for handling increased system complexity, state changes, new upcoming operation modes and dynamic environmental influences. Verena Schlager received an Erwin Wenzl Award. 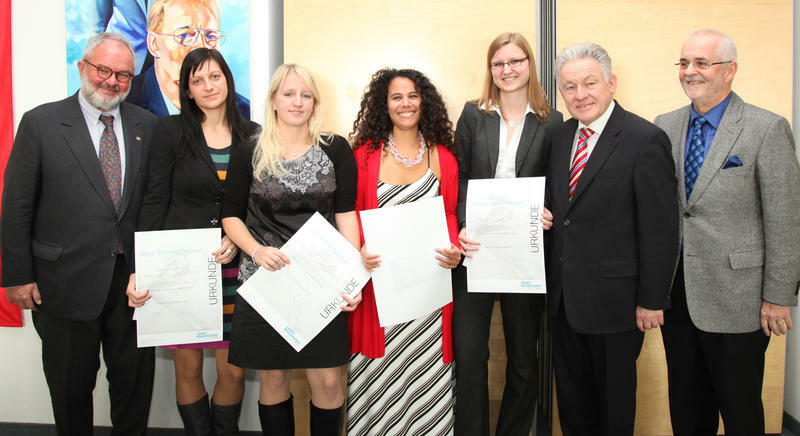 Verena Schlager received an Erwin Wenzl Award (Anerkennungspreis) for her Master Thesis "Coherence Probe Microscopy 3D Image Processing" on November 14, 2011. The JKU campus offices of our Department move into Science Park II. The offices of the Department of Knowledge-Based Mathematical Systems which are located on the JKU campus in Linz will move from the Kopfgebäude to the new Science Park II building, also located at the JKU Campus across the Altenbergerstraße. As of August 22, 2001, you can find us on the 6th floor in the Science Park II. The Department of Knowledge-based Mathematical Systems’ at the Johannes Kepler University Linz is offering a PhD position in the field of fault detection and diagnosis with data-driven process models based on system identification, soft computing and machine learning techniques. We are proud to announce the third public release of pureImage. The Department of Knowledge-based Mathematical Systems at the Johannes Kepler University Linz (Austria) is offering a PhD position in the field of performance optimization in the design of electrical drives with soft computing and data-driven methods. The basic task is to enhance the currently available techniques for initial design process parameter optimization specified by customers, in order to obtain an optimal cost-performance ratio of the electrical drives. Evolving fuzzy systems (EFS) are a powerful tool to cope with changing system dynamics, new operating conditions, varying human behaviors or environmental influences, as they are able to automatically adapt parameters and expand their structure, allowing on-line real-time modeling from data streams. In a wider sense, as they are able to permanently learn in dynamic enviroments and extending their 'memory' on-the-fly, they can be seen as a contribution to computational resp. artificial intelligence. After passing its first public beta test at Science night 2010, the next release of pureImage finally is released. * Addition of variable arguments to be used when a plug-in should handle multiple argument types. * The `Runtime` provides a registry mechanism for properties. * API cleanup of plug-in interface, `Runtime` and `BaseApplication`. The first public release of pureImage, version 1.0.0, has been made available under the terms of the GPL v3 today. After more than one year of development, five seminar and workshop presentations, countless discussions about architecture, and 432 revisions, we finally are convinced that pureImage is stable enough for its first release. The Johannes Kepler University Linz (Austria) invites applications for a fulltime, tenure-track research and teaching position at the Department of Knowledge-Based Mathematical Systems available October 1, 2010. Appointees will be expected to teach, pursue their research and perform department and university service. Required qualifications: PhD (or equivalent) in Mathematics or Computer Science, demonstrated achievements or potential for excellence in research, teaching, and professional service. The basic task is to develop enhanced methods for chemometric calibration models, which are used in the field of process analytic chemistry in order to perform automatic quantification of concentrations of relevant chemical substances. Apart from aiming at accurate quantification statements, other important goals include anomaly detection, prediction of future states and convergence of batch processes. Partner of the granted K-Project "Process Analytical Chemistry - Data Acquisition and Data Processing"
"PAC - Data Acquisition and Data Processing"
"Process Analytical Chemistry - Data Acquisition and Data Processing"
Our department is a scientific partner in the new Christian Doppler Laboratorium CDL-MS-MACH - CD-Labor für mikroskopische und spektroskopische Materialcharakterisierung, head: David Stifter, ZONA, JKU. Susanne Saminger-Platz has been awarded a "Talentförderungsprämie" in the category Science by the Upper Austrian government. The ceremony took place Tuesday, November 17, 10 am. FWF project "Image Similarity based on the Discrepancy Norm" has been started on October 1st, 2009, in co-operation with our research parner SCCH.